The best time to visit Sikkim is between mid-March and June but especially, April and May, when the rhododendrons and orchids are in bloom. However, temperatures can be high, especially in the valleys. During the monsoons, from the end of June until end September, rivers and roads become impenetrable, though plants nurtured by the incessant rain erupt again into bloom towards the end of August. October, when orchids bloom once again and November tend to have the clearest weather of all. As December approaches, it gets bitterly cold at high altitudes, and remains that way until early March, despite long periods of clear weather. The best time to visit this zone is from mid September to mid December, although it gets pretty cold by December. The high seasons again starts from mid-march & continues till mid June. During monsoon months ie; from June to September, the view of the mountains gets obscured & rainfall is pretty heavy (270 cm annually). Sikkim is the least populated state in India. There are three principal communities of Nepalese (75%), Lepchas (20%), and smaller proportions of Bhutias and Limbus. The Bhutias are Buddhist and so are most of the Lepchas. The Nepalese are chiefly Hindus. 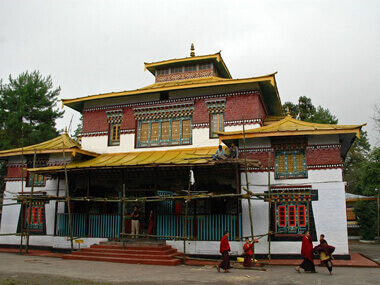 Lepchas or the Rong appear to be the original inhabitants of Sikkim as no legends of their migration are available. In the 13th century, the Bhutias from Kham area of Tibet came to the state. They believed in Buddhism of the Mahayana sect. The Nepalis were the last to enter Sikkim, in the mid 19th century. Though Hinduism is equally followed, Buddhism is entrenched in the tradition of the state. The people have faith in the Buddha, the dharma (his teachings), and the sangha (assembly of monks) where religious texts are studied, taught and preserved. Soaked in the religious tradition, the land has a spiritual ambience where prayer flags with inscriptions of Buddhist texts flutter around the boundary of the village to ward off evil spirits, prayer wheels rotate to the currents of water, and chortens and lucky signs are common sights.